Tombstone Small Prendergast Sculpture Statue Prop - Dino Rentos Studios, INC. 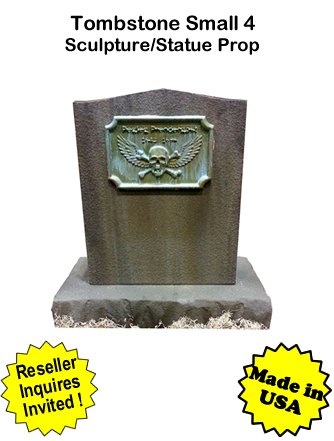 Turn any space into a spooky cemetery with this Tombstone Small 4 Sculpture Statue Prop! Set an eerie mood with this lifelike tombstone prop. Purchase our other Tombstone props to populate your space and create the setting for a haunted attraction! This Tombstone Small 4 Sculpture Statue Prop measures 30" tall x 28" wide x 14" deep (at base). It is cut in EPS foam then double coated with our exclusive flexible concrete coating which chemically bonds to the foam and stays permenant to the sculpture. This Tombstone Small 4 Sculpture Statue Prop is shipped to you via freight.